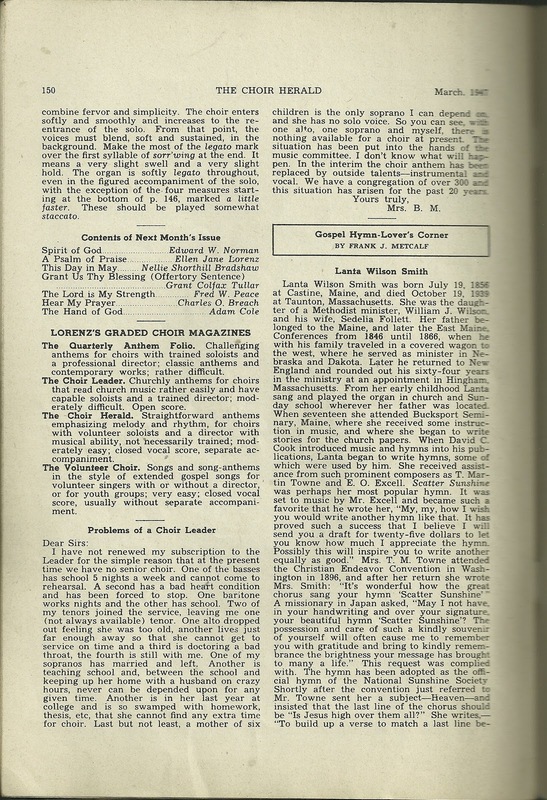 This issue of The Choir Herald, March 1947, contains several obituaries/bios, including one regarding Lanta Wilson, who married Rev. Charles Hartley Smith. In the 1860 Census of Thomaston, Maine, her name appears to be Alanta, possibly Atlanta. (Other bios in that issue include those of Charlie D. Tillman, Hart Pease Danks and Henry J. Zelley, which I'll discuss in future posts). Lanta Wilson Smith was born July 19, 1856 at Castine, Maine, and died October 19, 1939 at Taunton, Massachusetts. She was the daughter of a Methodist minister, William J. Wilson, and his wife Sedelia Follett. Her father belonged to the Maine, and later the East Maine Conferences from 1846 until 1866, when he with his family traveled in a covered wagon to the west, where he served as minister in Nebraska and Dakota. Later he returned to New England and founded out his sixty-four years in the ministry at an appointment in Hingham, Massachusetts. From her early childhood Lanta sang and played the organ in church and Sunday school wherever her father was located. When seventeen she attended Bucksport Seminary, Maine, where she received some instruction in music, and where she began to write stories for the church papers. When David C. Cook introduced music and hymns into his publications, Lanta began to write hymns, some of which were used by him. She received assistance from such prominent composers as T. Martin Towne and E. O. Excell. "Scatter Sunshine" [see link below] was perhaps her most popular hymn. It was set to music by Mr. Excell and became such a favorite that he wrote her, "My, my, how I wish you would write another hymn like that. It has proved such a success that I believe I will send you a draft for twenty-five dollars to let you know how much I appreciate the hymn. Possibly this will inspire you to write another equally as good." Mrs. T. M. Towne attended the Christian Endeavor Convention in Washington in 1896, and after her return she wrote Mrs. Smith: "It's wonderful how the great chorus sang your hymn "Scatter Sunshine". A missionary in Japan asked, "May I not have, in your handwriting and over your signature, your beautiful hymn "Scatter Sunshine"? The possession and care of such a kindly souvenir of yourself will often cause me to remember you with gratiude and bring to kindly remembrance the brightness your message has brought to many a life." This request was complied with. 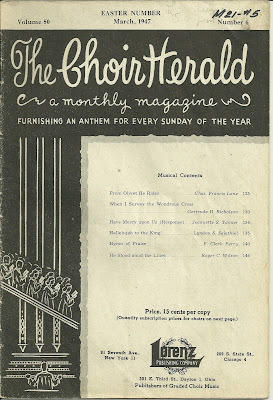 The hymn has been adopted as the official hymn of the National Sunshine Society. Shortly after the convention just referred to Mr. Towne sent her a subject - Heaven - and insisted that the last line of the chorus should be "Is Jesus high over them all?" She writes, - "To build up a verse to match a last line beginning with "Is" was something new, and he wanted it in a hurry." When he wrote back he said "Hurrah, I knew you could do it." Asa Hull was another voluminous composer for whom she wrote hymns. In 1880 Miss Wilson married Rev. C. Hartley Smith, and for twelve years they preached and ministered in Dakota. Both were musicians, and wherever they made calls, they were ask to sing some of the beloved hymns of the church. 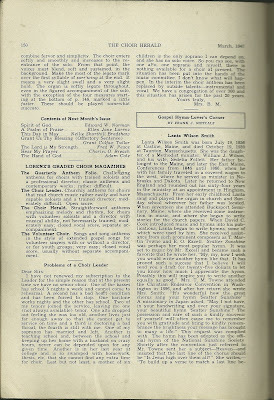 On returning east Mr. Smith joined the New England Southern Conference, and completed thirty-seven years of preaching. Mrs. Smith wrote more than five hundred poems, articles and hymns, the greater part of this number being hymns. Her songs were written for many occasions, Children's Day, Christmas and Easter; there were also temperance hymns and three cantatas. Of one of her songs, "The saints shall have dominion in the morning", Professor Black thought she was giving the saints too much, but when she sent him a large sheet of paper filled with Bible references to the saints, he replied, "I give up. The saints are in for a pretty good time." She left her singing voice out on the prairie, but continued to write even to her eightieth year. 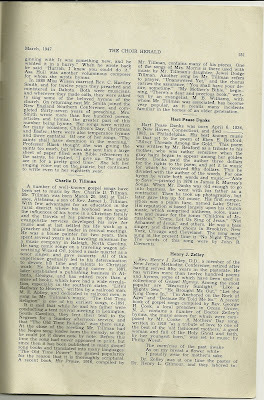 I found a short bio, below, of Lanta's father William Jones Wilson in the Yearbook of the Annual Conference of the Methodist Episcopal Church, New England Southern Conference 1894 on Google books. William Jones Wilson was born in Union, Me., April 29, 1818, and died in Warren, R. I., March 29, 1890. Left an orphan at an early age, he was placed in charge of relatives. He was converted at seven years of age, but owing to a lack of interest on the part of his relatives be was not received into the church. At about nineteen years of age he was reclaimed and united with the Methodist Episcopal Church. He was soon licensed as an ezhorter, and in bis early twenties was licensed to preach. He joined the Maine Conference in 184G. The next year he was married to Miss Sedelia A. Follett, and then began an itinerant life, which continued for nearly rifty-two years. Four children were born to them, of whom two,—Mrs. Rev. C. H. Smith of Phenix, li. I., and Mrs. Rev. H. W. Brown of Warren, 11, I., together with their mother, surviv e.
At the division of the Maine Conference, Brother Wilson became a member of the East Maine Conference, where he continued to travel for about twenty years. Owing to the ill health of his wife, he removed by transfer to the West Wisconsin Conference, where he continued for three years. He was then transferred to the Wisconsin Conference, in which he continued his relation until death. Through the continued ill health of his wife he was again obliged to go West, going to central Nebraska in 1872. Here he had work under the Presiding Elder, his circuit being the western half of the State of Nebraska. During the four years of bis stay he preached the first sermon in many places where to-day are well organized societies. I have frequently accompanied him on his preaching tours, in which be traveled from ten to seventy-rive miles to preach on the Sabbath. His later ministry has been in Wisconsin, South Dakota, Maine, and since our last Conference in Hingham, Mass. During much of bis ministerial life he bus done heronpioneer work for the Master. His most notable revivals were in Belfast, Me., where over five hundred were converted and a new brick church erected, and in Brodhead, Wis , where over two hundred were added to the church. His ministerial life has been one of continued success. He was emphatically an evangelistic preacher, and souls were everywhere added to the church. He arrived in Hingham, Mass., on his eightieth birthday, a great disappointment to the people who were looking for a young man: tint before the first service was closed, he was voted by all to be young enough to suit. The people there count it a great privilege ti"> have him buried in their midst. Much might be said of his long and active career as a Methodist preacher. He was in Maine during the noted Maine-lawcontroversy, during the trying times of Millerism, and he also frequently contended with the Universalists against their heretical teachings. He was a loyalist to the church of his choice, learning bis letters from the Zion's Herald during its earliest history, and ever cherished an increasing love for Methodism. He preached In thirty-six different circuits and stations. In bis death the church and the world lose a Methodist preacher of the grand old heroic type. The funeral services were conducted at Hingham, Mass., by the Presiding Elder, Dr. E. C. Bass. Unfortunately, the bio above doesn't include the names of the parents of William Jones Wilson. His wife, Sedelia Abigail (Follett) Wilson, was born 9 February 1825 in Wellington, Maine, the daughter of Otis and Lucy (Lyon) Follett, both born in Augusta, Maine. The parents of Otis Follett were Jesse and Judith (Young) Follett. The parents of Lucy (Lyon) Follett were Alpheus and Lucy (Blake) Lyon. William Jones Wilson and wife Sedelia Abigail (Follett) Wilson had in addition to Lanta, I believe, three other children. One of them was Abbie Ellen Wilson, who married Reverend Henry Wheaton Brown. Their son Charles Wilson Brown was a noted professor of geology at Brown University in Providence, Rhode Island. 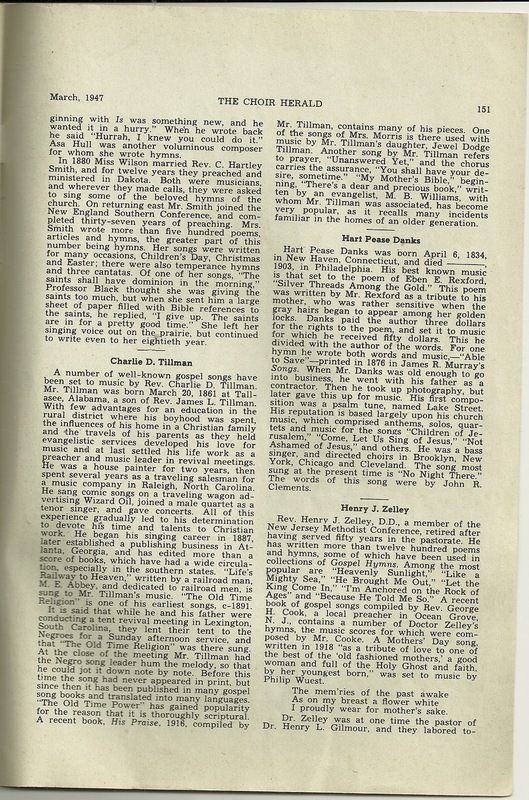 It appears that Lanta and Charles Hartley Smith had two sons, one of whom may have died young. Their son Elmer G. Wilson Smith was born in South Dakota in 1899 and was living in Minnesota at the time of the 1920 Census. If you have any corrections, additions (particularly the parents of William Jones Wilson, born Union, Maine in 1818) or insights regarding the information presented above, please leave a comment or contact me directly. Just for grins and giggles, I searched for Scatter Sunshine on YouTube. Enjoy!